Credit Suisse has resource-rich Aussies doing well, but Abenomics has not been good for Japan’s ranking. Australians may be richer than ever, but Japan’s “Abenomics” has somewhat surprisingly seen Asia slip in the latest rankings of global wealth. According to the 2013 Credit Suisse Wealth Report released Wednesday, global wealth has reached a new all-time high of $241 trillion, with average global wealth breaching the $50,000 line for the first time since 2007, to hit a record $51,600 per adult. Nevertheless, the Asia-Pacific region excluding China and India dropped $4.5 trillion to $48 trillion, a distant third behind Europe’s $76 trillion and North America’s $79 trillion. The report found global wealth had doubled since 2000, despite “a decade of negative real returns on equities, several equity bear markets and the collapse of housing bubbles.” These negatives were apparently more than offset by strong economic growth and rising population levels in emerging nations. However, the authors described this year’s results as “a tale of two countries,” with the United States gaining $8.1 trillion on rising house and equity prices, accounting for 72 percent of the total rise, while Japan lost $5.8 trillion because of a weaker yen, despite a 2 percent gain in domestic terms. “Aggressive” monetary policy by the Bank of Japan spurred a 52 percent gain in Japanese stocks in the year to mid-2013, but with equities accounting for only 10 percent of Japanese household wealth, the 22 percent decline in the yen against the U.S. dollar hit the nation’s rich. “Japan suffered very little during the global financial crisis – in fact personal wealth grew by 21 percent between 2007 and 2008. However, in marked contrast to recent performance by the United States, total wealth is now just 1 percent above the 2008 level,” the authors said. By contrast, Chinese total wealth jumped $1.4 trillion to top $22 trillion, although this was accompanied by a 20 percent rise in debt, while India and South Korea were among eight countries to have increased wealth by more than $200 billion. “China now has more people in the top 10 percent of global wealth holders than any other country except for the USA and Japan,” the report said. By comparison, “residents of India are heavily concentrated in the lower wealth strata” due to extreme wealth inequality and accounted for just 4 percent of the global middle class compared to China’s more than one third. Australian media seized upon the report’s finding that the median wealth of Aussies now stood at $219,505 – the world’s highest – although the resource-rich nation slipped to second behind the Swiss on average wealth per person at $402,578 versus $513,000. By contrast, Japan slipped out of the top-10 table of wealth per adult after being fourth-ranked in the previous report, although it placed in the $110,000 to $150,000 range for median wealth, compared to the United States’ $45,000. The number of Aussie millionaires increased by 38,000 to 1.1 million people, or 6.8 percent of the population, compared to an average of 0.7 percent globally and 0.1 percent in China. Singapore was marked down with a reported 4.4 percent of its population being classed as millionaires, despite other research putting it on top globally in wealth per capita. Nevertheless, the United States remained the world’s millionaire capital, with 13.2 million people achieving the ranking and nearly 46,000 in the ultra-high $50 million plus category. The report noted a continued concentration of wealth, with the world’s top 1 percent accounting for nearly half of all global assets and the bottom half owning less than 1 percent. Looking ahead, Credit Suisse said global wealth would rise by nearly 40 percent over the next five years to reach $334 trillion, with emerging markets accounting for nearly a third of the growth. By 2018, the Asia-Pacific region is expected to account for $110 trillion, posting the strongest growth rate of 8.4 percent, overtaking the United States in 2017. “Japan will likely remain the second wealthiest country in the world until China overtakes it, probably at some point in 2016. 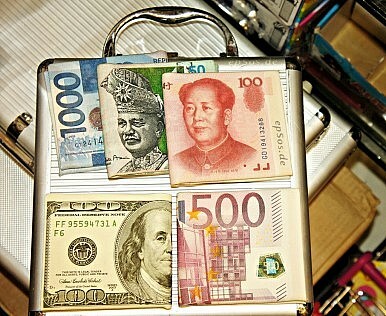 By 2018, Chinese wealth is expected to approximate the level of U.S. wealth in 1993,” the report said. However, the authors warned that a downturn in equity prices could hit the forecasts, particularly nations where financial assets make up a large proportion of wealth, such as the U.S.
Ironically, a plunge in the dollar caused by further fiscal drama would boost Japanese wealth, but potentially at the expense of Abenomics. Suddenly, the Japanese prime minister and the U.S. rich have a vested interest. Economist Jesper Koll on what to expect from Abenomics and Japan's economy in 2019. Understanding Japan’s Struggle to Reform the Shareholder-Management RelationshipJapan GDP Growth: Partying Like It’s 1989?No Rest For Reform As Japan’s Economy Surges AheadAbenomics Back On Track as Japan's Abe Marks Longevity RecordDid Abe Convince Trump Japan Wasn't a Currency Manipulator?